The Joe Kelner Trio consists of Adam Shulman on piano, Knox Barber on bass, and Joe Kelner on drums, playing classic jazz standards. Adam Shulman is a staple of the bay area jazz scene and has also worked with many other internationally renowned artists Stefon Harris, Willie Jones III, Dayna Stephens, Miguel Zenon, Mark Murphy, Alan Harris, Luciana Souza, Paula West, Larry Coryell, Sean Jones, Grant Stewart, John Clayton, Bobby Hutcherson, Bria Skonberg and with the Glenn Miller Orchestra. 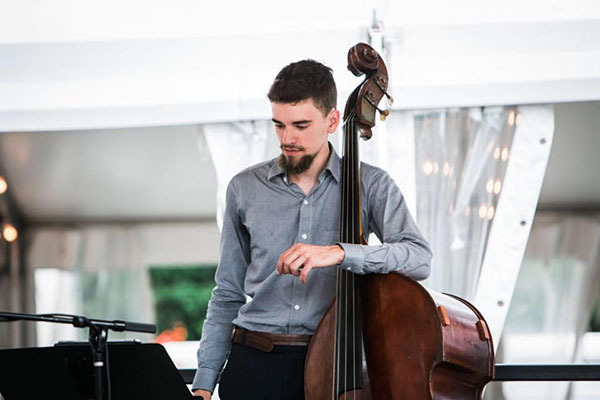 Knox Barber is a jazz bassist hailing from the Washington, D.C. area. He believes in serving the music and the groove to the fullest. He has studied jazz with excellent teachers including Matt Penman, Paul Carr, Michael Bowie, and Jim McFalls. He has also played at the Monterey, Chicago, and Mid-Atlantic Jazz Festivals. He has shared stages with world-class musicians such as David Sanchez, Warren Wolf, Sean Jones, Matt Wilson, Simon Rowe, and Paul Carr. Joe Kelner has spent 2 years playing in the SFJAZZ Monday Night Big Band led by Adam Theis, he is the drum coach of the Giant Steps Program through the StanfordJazz Workshop, he is the house drummer of the Playa Jazz Cafe at Burning Man, and he is very active in the Bay Area Jazz scene playing gigs at numerous venues/bars/restaurants such as SFJAZZ, Club Deluxe, Black Cat, Osteria Divino, Cafe Pink House, and many more. He has studied with Tootie Heath, Benny Greb, Allison Miller, Mike Clark, Jeff Marrs, and many more.